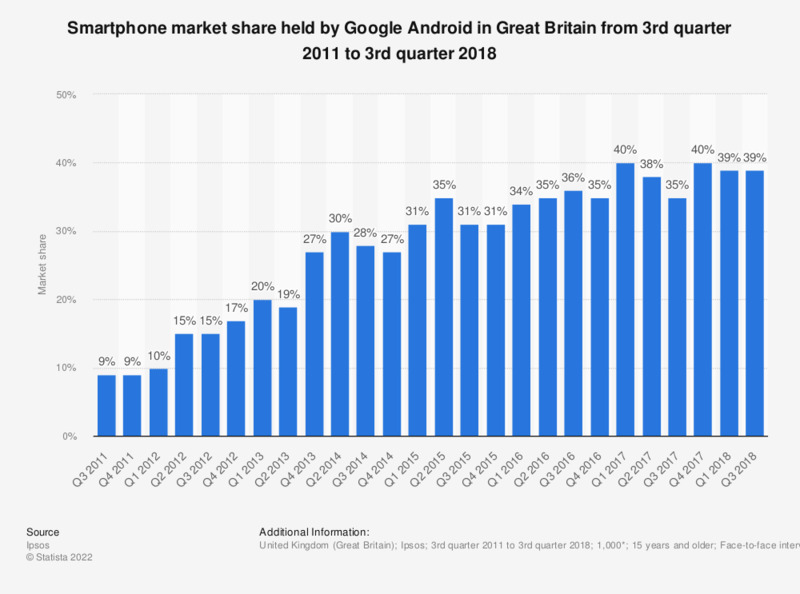 The statistic shows the smartphone market share held by Google Android in Great Britain from the third quarter 2011 to the third quarter of 2018. The number of survey respondents with an Android phone in the fourth quarter of 2011 was nine percent. The percentage of respondents claiming to have an Android phone reached a peak of 39 percent in the third quarter of 2018. Android is a mobile operating system developed by Google. It is designed primarily for touch screen devices such as smartphones and tablets. Google's Android dominated the market share of mobile operating systems along with iOS that is developed by Apple Inc.